There are currently 10 users and 4244 guests online. thats the one new sponsors of site made razorline, richmond tigers emblem? look more than 3,5 tons ????? What I was thinking solly. Yeh i looked at the 8.5m version and it was well over 4t! Hence didnt buy it! looking at the back of that cruiser there is a fair amount of weight on the tow ball as well! Heavies are not the only issue, have an accident and hurt someone your liable, have an accident and smash up your pride and joy no insurance! Not a fan of that tub, where is the deck space? was at the Mandurah Boat Show last year from memory. Still not legal you cant get a GCM upgrade. I had GVM and suspension upgrade on my 200 series ! thats right, in WA there is no way to upgrade the tow rating of a vehicle that has one designated by the manufacturer. Some states seem to be able to do it but the DOT told me as above. Sweet rig. 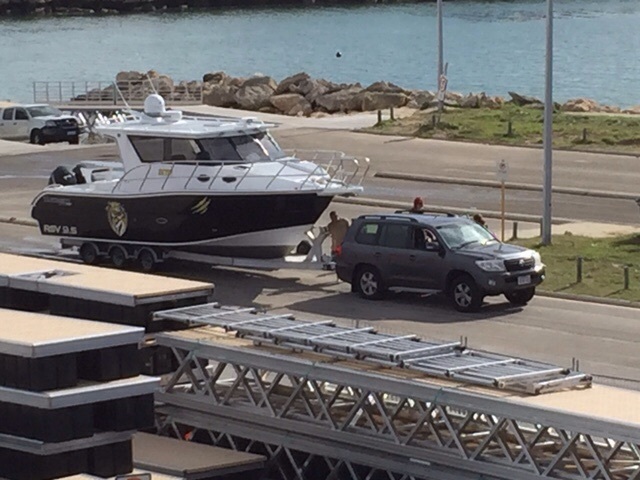 I guess if you could afford the boat then something suitable to tow shouldn't be a problem. Just saw thing thing on facebook up for sale..
Friggen big dingy!!! Saw it on the side of the road, rediculous towing it with that toy. Gonna kill someone. What a great piece of ali jealous as.